The writers here, as MacKenzie notes, innovate through an epistolary tale, a film script with directions, and a dialogue with unnamed personae. This approach represents a return to form, turning its back on the subject- and issues-based bias of Dai Smith’s Library of Wales anthologies, Story, Vol I and Vol II, published last summer. It reconnects with the modernism of short story veteran Rhys Davies, who was included by Katie Gramich in the Encyclopedia of Literary Modernism. 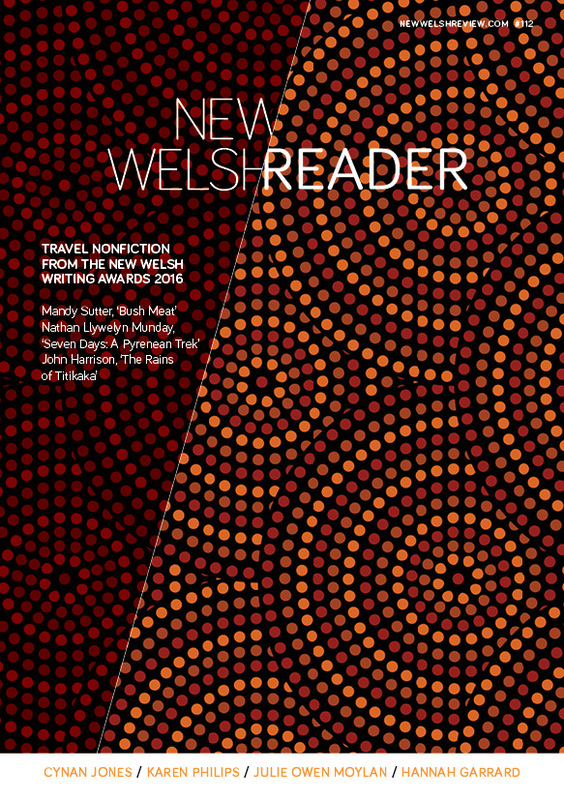 The latest anthology of winning entries of this year’s Rhys Davies Short Story Competition, Catch of the Day and Other Stories (Accent), was reviewed at newwelshreview.com/list-review.php on 1 October. Dan Bradley quotes Davies’ belief that a short story ‘should contain’ a ‘tiny, concentrated explosion’ and concludes that such ‘miniature pyrotechnics’, as Bradley coins them, characterise this collection, leading to structural predictability, ‘snappy reveals and plot twists’ rather than ‘innovative writing’. In the prize’s defence it might be questioned whether competition candidates pay any attention to the style of writers in whose name a prize is given. It is noteworthy, however, that commissioned and single-author short fiction collections, benefitting as they do from considered curation by editor or author, are currently getting better reviews than anthologies of open competitions. Internationalism and diversity are also the trademark of the second collection reviewed at newwelshreview.com/list-review.php on the same date, this time dedicated to Japan’s capital (and, hearteningly, presenting two translators from Wales, Dan Bradley and Jonathan Lloyd-Davies). Like Seren’s collection, The Book of Tokyo, A City in Short Fiction eschews national stereotypes. As reviewer Eluned Gramich puts it, ‘any wistful narratives about cherry blossom are quickly dispensed with’ and ‘the ubiquitous tropes of bowing and chopsticks’ avoided. Instead the ‘black’ mood of Rhys Davies’ contemporary acolytes is favoured, alongside ‘quasi-horror’ and surreal touches such as a serial-killer satyr. The Japanese collection also shares with its Welsh counterparts an editorial policy, incidentally the USP of this magazine, of setting established writers (and translators in this case) alongside those that are emerging and previously unpublished. I wonder to what extent the Welsh collections share Tokyo’s conflicted preoccupation with what seems foreign, different or, even, more powerful (in the latter’s case, ‘The West’)? But perhaps that would be an old-fashioned question that prioritises politics over style. Our seventeen pieces of review and comment published on 1 October are exclusive to subscribers. If you missed them, look out for Duncan Bush on language, controversy and subsidy (not Ruck revisited but hopefully stimulating response); John Barnie on the flaws of Alun Lewis, man and poet, as Lewis’ unpublished novel and a second biography of him are published; Chris Moss on Robert Minhinnick’s ‘profoundly meditative’ novel of life on the fringes, Limestone Man, and two reviews of books touching on (among a great number of other things) psychoanalytical approaches to Dylan Thomas. One of these is a rave review by Amy McCauley of John Goodby’s The Poetry of Dylan Thomas, Under the Spelling Wall which she finds to be a thorough, original, vibrant and approachable work of scholarship which makes a tenacious and flawlessly executed case for reassessing Thomas as a worthy subject for serious literary criticism. The second aforementioned review is by Helen Pendry. The pieces referred to above, along with a review of Nicky Arscott’s pamphlet for Rack Press, Soft Mutation, and other articles, were published in the second of our subscriber-exclusive online supplements, Review 3, on 1 October. If you have not read or heard about any of these then you urgently need to contact Bronwen Williams on admin@ newwelshreview.com to get your subscriber ID which you can use together with your own postcode, to vault our paywall. Soft Mutation shows an American influence on Arscott. This comes partly from her recent, Arts Council of Wales-supported research into emigration from her home patch of Llanbrynmair, Powys, to US states, particularly Tennessee. We are delighted to publish here in our winter edition of the Reader, what I think is an innovation for the magazine: a poetry comic, ‘Stallion Ford’, that is in a series with US poet Greg Koehler, and nails with tenderness and humour themes of longing, disinheritance and displacement. Migration, from, into and via Sicily, is also the subject of Robert Minhinnick’s impressionistic and impassioned story, ‘Sicilian Driftwood’, while we are delighted to present newcomer Alys Conran’s piece on writing her debut novel for Parthian, Pigeon, in a series of work commissioned from the author including a place in our winter poetry showcase video published on 1 November. The rest of this issue is dedicated to our season’s theme, ‘Family’, although this might easily have been ‘The Domineering Father’. See our essay by Harry Heuser on George Powell of Nanteos’ uneasy belonging to his family and his home town, which is expressed in his curious art collection and its long-delayed route to finding a home. And also one by Katrina Naomi on how the violence of Pascale Petit’s conflicted relationship with her extremely abusive father becomes transformative in her poetry. Stories by Anna Lewis and Jem Poster contain the same patriarchal personality, although Poster’s protagonist has a slow poison whereas Lewis’ ‘Mr Wolf’ is more of a mythic, but no less dangerous, beast. The latter puts me in mind of Tony Bianchi’s powerful exploration of what I take to be the effect of Autism Spectrum Disorder (ASD) on generations and within sexual relationships, Dwy Farwolaeth Endaf Rowlands (The Two Deaths of Endaf Rowlands). Bianchi excels across his fiction in the ASD-typical detached, hairtrigger-sensual, pattern-obsessed and micro-managing male protagonist, often living in the shadow of a domineering father with a similarly controlling nature. Our video interview with Bianchi, published on 1 November, explores how this came about, especially in his novel, Harry Selwyn’s Last Race (Parthian). The video will also look at Bianchi’s recurring motif of a witness’ strangely inadequate response to the death of an intimate. Dwy Farwolaeth thoroughly deserved this summer’s National Eisteddfod Prose Medal: never again will I hear the phrase ‘Tyn dy specs’ (Take off your specs) or see Eric Morecambe wiggling his own glasses without turning to cold thoughts of domestic violence. So this edition’s theme of the family’s shady secrets returns. And yet in Bianchi’s novel, while Endaf and Tomos share a dark father–son relationship, Tomos’ mother and grandparents are positive characters, the family launderette is called Sunshine Cleaners and, despite Tomos’ tussle at the border between solitary and lonely states, Dwy Farwolaeth ultimately brings its own brand of sunshine. Part of this editorial first appeared on 1 October in Review 3.